Learn All About The Drift Ghost 4K Through My Detailed Review! The extremely popular Ghost series offered by Drift continues with its latest offering, the Ghost 4K! I couldn’t help but write a detailed Drift Ghost 4K review which will explain to you in detail all you need to know about this action camera. 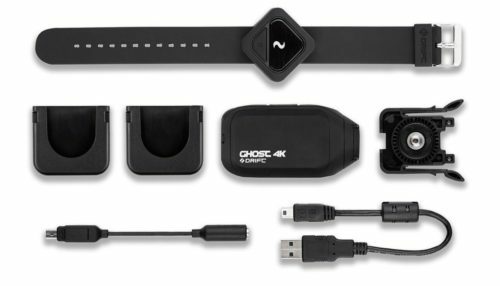 In a nutshell, the Ghost 4K is a bullet-style action camera that can capture 4K videos at 25 fps, Ultra HD videos at 30 fps, 1080p videos at 120 fps, and 720p videos at 240 fps. This action camera also excels in photo capturing, as it can shoot up to 12 megapixels, individually or in bursts. It made it to my list of best action cameras for 2018! 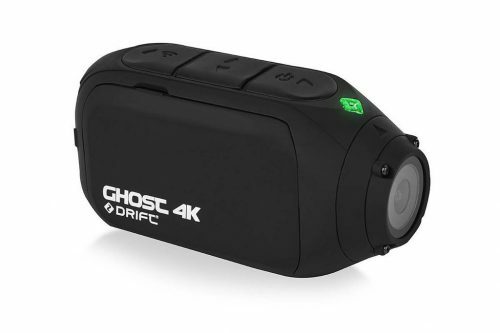 In this article, we will be talking about everything there is to know including all the important specifications and features of the Drift Ghost 4K action camera. Its design, video, audio and photo quality, resolutions and frame rates, controls, battery life, price, and comparison with the GoPro Hero 6 Black will be discussed in detail. Read on to know more about the Drift Ghost 4K action camera through my review. The Drift Ghost 4K action camera features an LCD screen, which is important because it allows you to set up your shots, change the settings, and quickly playback the photos and videos to check if you got the shot you are aiming for. Here’s a link to detailed user guide. It also has a standard quarter-inch mount that offers you a variety of mounting options. The action camera measures 1.3 x 2 x 4.1 inches and it weighs around 6 ounces. It can be strapped to the side of your goggles or helmet and it can cover a field of view of 170 degrees that comes with a wide and distorted view. It should be noted, however, that you must be careful about the mounting because you may crop off a side of your video with whatever it is you used to attach the action camera. You will find the battery, ports, and the memory card slot at the back of the action camera. You will also find a mini USB port that will allow you to charge the camera and transfer files from the camera to your computer. It also features an HDMI port and a 3.55mm jack that you can use to connect an external mic. The action camera includes two cover hatches: one is waterproof while the other one is only splash resistant, used for covering the USB port and mic jack. With the Drift Ghost 4K’s price, it is only reasonable that you expect great video, audio and photo quality. After all, you are paying the price due to the features alone. Generally, the videos are of very good quality, as a lot of its consumers were pleased with the results. Its 1080p resolution video exhibits detail without it seeming like it has undergone extreme post-processing. However, you should be aware that if the scene has a lot of movements, you might notice artifacts, as well as a significant loss of detail. The color quality on the Drift Ghost 4K action camera is not as powerful as its leading competitors but compromises on its white balance features. You might also find aliasing artifacts and a fair amount of chromatic aberration during high-contrast captures. In addition, you will also notice an increase in noise when shooting in low light conditions. While this scenario is not at all unusual, you will still be able to find well-lit indoor videos watchable. If you are considering to drop the resolution, it would cost you a significant loss of detail. However, when shooting in 720p at 60 fps, the result would still be pretty good. Overall, the footage is still above average considering the flexibility and features of the action camera. The audio has also been proven to have a good quality. The built-in microphone, specifically, does a decent job due to the three levels of sensitivity adjustment. In addition, you can always plug in a better external microphone, which is a feature you cannot do with other action cameras. As with many action cameras, the Drift Ghost 4K takes video a lot better than photos. You will be able to capture great photos for online sharing or small prints but you cannot do high detail enlarging, as well as heavy cropping. The Drift Ghost 4K action camera is not only equipped with a full 17:1 4K (4096 x 2160) at 25 fps, it also boasts its 16:9 Ultra HD 4K (3840 x 2160) at 30 fps, 1080p (1920 x 1080) at 120 fps, and 720p at an impressive 240 fps. The 4K quality of the action camera is unbelievably stunning and you can watch this footage on a 75” screen. The higher frame rates improve the overall production value that results in significant enhancements, especially in motorcycle footage wherein a moving subject is moving across the screen at full speed. One major issue and considered a downside, is the blocking effect that is apparent in both the following and on-board footage. This has never been a problem with the GoPro, which is the reason why a lot of consumers are expecting an upgrade to the newer Drift action cameras. The remote control is one of the most advanced and coolest features of the Drift Ghost 4K action camera. It is very easy to operate, as you only need to scroll and activate it and pair it with the action camera. Once there is a confirmation that the pairing has been successful, then you are good to go. Interestingly, it is also a watch that has an indicator of what mode are using the camera for. A green light would mean that you are in video mode, yellow on photo mode, purple on time-lapse mode, and cyan on photo burst. With this feature, you will be able to cycle through the settings once you have set up the camera. You will find 3 buttons on top of the action camera and a small display screen at the back. The buttons at the top include the power button and picture/video operation that allows you to start and stop capturing. The middle button, on the other hand, permits you to switch in between the settings and modes. In addition, the button found at the back allows for the Wi-Fi activation. The LCD, as mentioned above, is one of the greatest features of the Drift Ghost 4K action camera. It allows you to control most of the action camera’s settings. For example, swiping down will permit you to check out the pictures taken. You can scroll through the photos and delete them with ease. Swiping your finger right, you will be granted access to all the features and functions such as the field of view, ISO, BIT, Wi-Fi, battery life, power modes, and camera modes. Swiping down, on the other hand, will allow you to choose the mode that you prefer with photo, time lapse, and burst. Swiping to the left will allow you to change the speaker settings, start up modes, and other specific features. 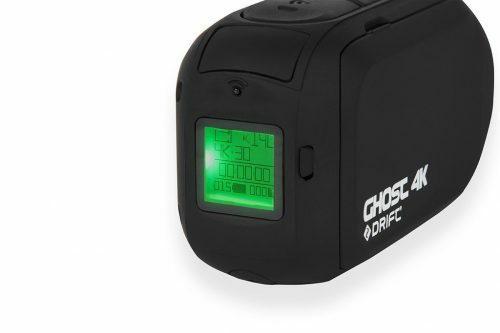 The Drift Ghost 4K action camera is equipped with 1500mAh battery and can be charged via USB. You will also be able to extend the battery life with an external battery. The action camera will not run out of juice for up to 3-hour recording time at 77°F temperature. In addition, it features a removable battery, so you would not need to worry about not finishing your footage. The Drift Ghost 4K action camera is already considered a high-end camera, as it is priced a little over USD 300. With the features reviewed above, you should not be expecting anything less from this action camera. A standard box included in every purchase includes the following: The Drift Ghost 4K action camera, a universal action camera clip, a remote control and its strap, a mini USB charging cable, a USB microphone adaptor cable and converter, an instructions manual, a flat adhesive mount, and a curved adhesive mount. With the mentioned accessories, it is a guarantee that you will be getting a great value for the price you pay. One downside, however, is the features. There are several reviews on the Drift Ghost 4K camera with regards to its price and the lack of features compared with other action cameras. For some, this action camera is priced a little higher that one would expect far better quality and attention to detail. In my honest opinion, it does not really exhibit quality engineering. In this section, a comparison between the Drift Ghost 4K action camera and GoPro Hero 6 Black will be discussed in detail. In the end, you will be able to weigh each model’s difference, allowing you to better evaluate your options. For the camera sensor, the GoPro Hero 6 Black is equipped with 1 x CMOS sensor, no color filter, a 12-megapixel sensor resolution and no effective pixels while the Drift Ghost 4K action camera is equipped with 1 x 1/2.3” CMOS, Bayer color filter, 12-megapixel sensor resolution and 12 megapixel effective pixels for photos. While both had fixed focus, the Drift Ghost 4K action camera features a 19.7”/50cm minimum focusing distance and ultra-wide angle of view, unlike the GoPro Hero 6 Black. The Drift Ghost 4K action camera can shoot 4096 x 2160 at 25 fps, 3840 x 2160 at 24, 25, and 30 fps, 2704 x 1520 at 24, 25, 30 and 60 fps, 1920 x 1080 at 24, 25, 30, 50, 60, 100, and 120 fps, and 1280 x 720 at 25, 30, 48, 50, 60, 200, and 240 fps. It has an aspect ratio of 16:9 and 17:9 and has slow motion mode that allows recording at 240 fps at 1280 x 720, 200 fps at 1280 x 720, 120 fps at 1920 x 1080, and 100 fps at 1920 x 1080. The GoPro Hero 6 Black, on the other hand, can shoot 3840 x 2880 at 24, 25, and 30 fps, 3840 x 2160 at 24, 25, 30, 50, and 60 fps, 2704 x 2028 at 24, 25, 30, 50, and 60 fps, 2704 x 1520 at 24, 25, 40, 50, 60, 100, and 120 fps, 1920 x 1440 at 24, 25, 30, 50, and 60 fps, and 1920 x 1080 at 24, 25, 30, 50, 60, 100, 120, and 240 fps. It has an aspect ratio of 16:9 and 4:3 but does not allow slow motion mode. In terms of exposure control, both cameras are not equipped with shutter speed, photo ISO range, video ISO range, and streaming ISO range. However, center-weighted exposure metering and Bluetooth are featured in the Drift Ghost 4K action camera. For the features, both cameras have digital image stabilization, built-in microphones, and speakers but do not have white balance modes and creative effects. 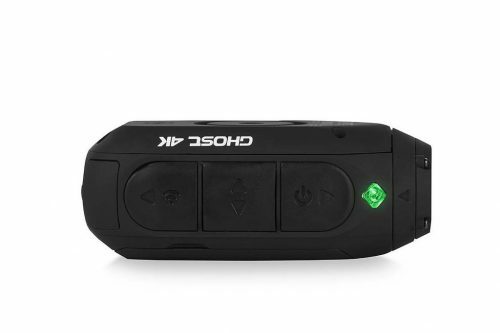 For connectivity, the Drift Ghost 4K action camera features 1 USB Micro-B while the GoPro does not. Both have microphone inputs so you can use an external mic. The GoPro has a rechargeable lithium-ion battery pack with 1220mAh while the Drift has a rechargeable battery pack with 1500mAh. Charging method are both via USB but the GoPro action camera has an AC adapter. With the above Drift Ghost 4K review and comparison with the GoPro Hero 6 Black, I personally do not find the Drift Ghost 4K action camera worth its price. In addition, I hope that the brand will have improvements on a lot of specific features to make their product a little tougher. It is also interesting to know that a lot of consumers have raised concerns and it seems like the manufacturer is only testing their products for paying customers. While the price is certainly an issue here, it does have the best features that make it stand out with other lower end action cameras. They are smaller and lighter than most action cameras but they do not seem rugged enough. With the reviews presented above, I hope that you have learned a lot about the Drift Ghost 4K action camera. If you’re looking for a cheaper and lower option from Drift, you can have a look at the Drift Ghost X, it’s a good quality 1080p action cam.